The first day of a new week, a new month, and it feels like a new season as we start to adjust to the clocks going forward too! The first time here as a mum of two boys, as our second son was born in December. There feels like too much to write to know where to start, so all I will say for now is that he is wonderful, happy and healthy, I found the pregnancy tough but the delivery went really well, and T has taken to being a big brother brilliantly. We are very lucky, if also a little exhausted. The first trip to the library today in a few weeks, only to find that one of our favourite librarians is leaving. We first met him when I was on maternity leave with T, and the library became one of the first places I visited regularly, a haven to a new mum, and brimming with nostalgia as I attended story and song sessions in the same room that I had loved to visit with my own mum many years ago. T knows him by name and talks about him every time we pass the library, he encouraged me to attend the book group, where I made my first real "mum friends", and he will be sorely missed. It has taken me far longer than it would seem to write the above, interspersed as it has been with multiple episodes of settling the baby back to sleep! I am going to leave it there, with a hope to be back again soon. After an initial week that was falsely reassuring suddenly we were back in classic technical challenge territory. A recipe for a dish that no-one has ever heard of? Check. At least one obscure and difficult to source ingredient? Check (pistachio essence I'm looking at you). A messy, multistage recipe that takes hours and assumes ownership of at least three stand mixers (or a washing up minion)? Check. Costs more to make than would ever be reasonable to spend on a cake and makes you realise what a ridiculous budget the programme must have, not least for pistachio nuts alone? Check. A weird flavour combination that makes you doubt if you will even want to eat the end result? Spinach icing, you say? Check. And so it was, I found myself preparing to make a Gâteau Vert. Apparently it was Claude Monet's favourite birthday cake, though that didn't make me any more enthused. My mum spoke to me on Wednesday, and summed up the general mood when she asked "you're not going to make that cake with the spinach are you?". I urgently acquired pistachio essence (huge kudos here to a website I have never used before called StefChef who shipped it quickly, were competitively priced and had lovely customer service, I recommend them completely for any sudden pistachio essence needs you may have). I armed myself with pistachios, edible flowers, a huge amount of spinach, a bottle of kirsch and a receipt for nearly £30 which The Husband has not been privy to. Oh this cake, can you tell I wasn't a fan? Everything I owned was green, there was a persistent odour of pistachio and spinach, it took forever and the worst bit of all, I'm not really sure I even liked it. The Husband rejected it outright at the mere mention of spinach, my parents valiantly tried it and said what a lovely flavour it had, and T devoured it but he is not exactly a discerning audience when it comes to cake. I didn't mind it, the flavour was pleasant enough, and there wasn't actually any taste of spinach at all. While that felt like a success of sorts, it also begged the question of why I had bothered to use it at all. 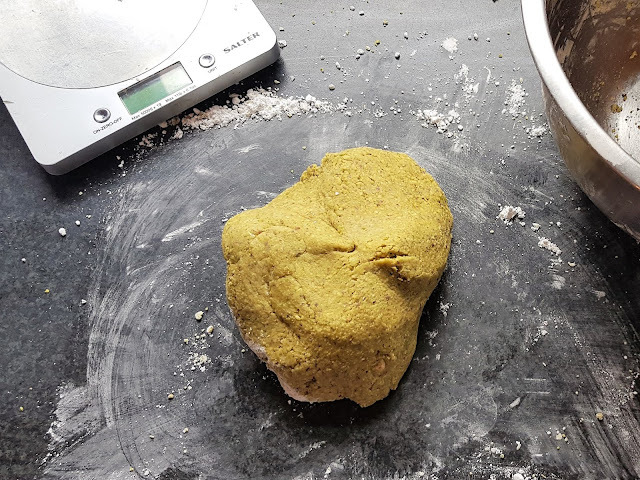 I know the point of it was to colour the whole cake naturally, but it did feel slightly excessive to wilt and blitz and puree and squeeze spinach, particularly as since Monet's time we have developed the technology to allow purchase of a wonderful range of purpose-made food colourings. 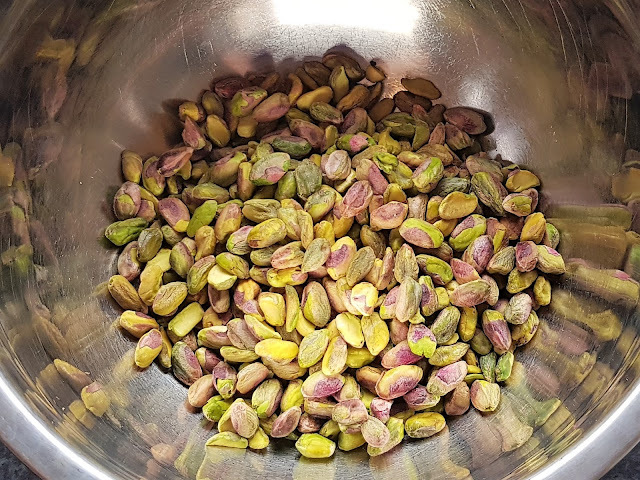 It wasn't overly difficult, it was just long-winded, and I found myself getting thoroughly disheartened when I kept realising I had to grind yet more pistachios, or start adding spinach water to yet another bowl. There was another episode, much like with the Wagon Wheels, of making syrup while whisking an egg and then rapidly adding one mixture to the other, but that was about as complicated as it got. The marzipan was the nicest part, and overall it looked quite appealing but I fear my genoise was where the fault lay. 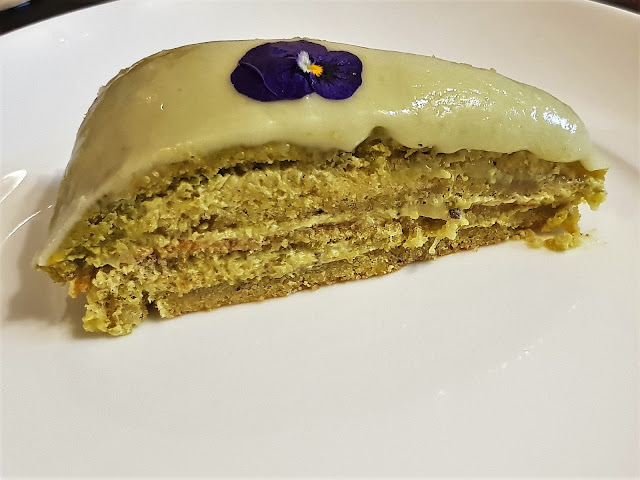 It seems that I have not learnt from the Mokatines of 2015, and although it appeared entirely successful from the outside, as I sliced through the genoise, much of the middle was quite dense, and again I could see the occasional pocket of flour. I think I remain too tentative when combining the mixture, and I guess the stodgy central layer of genoise is what dried out the gateau and made it less palatable than it might otherwise have been. 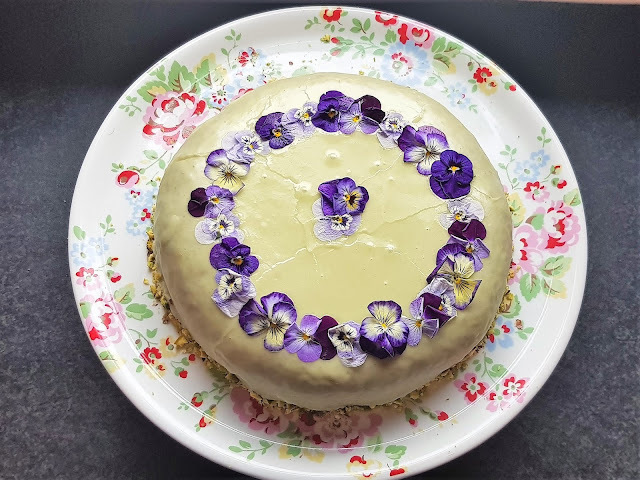 The overall effect is quite pleasing visually, assuming you like the colour green on a cake, and I have learnt that edible flowers can make most things look appealing. I also managed to disguise the fact that despite buying a ridiculous amount of pistachio nuts I still managed to miscalculate and somehow ended up with barely any at the end with which to decorate the edge. However, I think it says it all when I admit that, even in a house with a cake-loving toddler and a permanently hungry pregnant woman, after a few days languishing on the counter, some of the leftovers ended up in the bin. And in a move that would make Monet despair, T and I spent an happy afternoon last week making packet mix fairy cakes and sticking edible Peppa Pig decorations on the top, a process which was both more enjoyable and more successful (and didn't result in any leftovers!). If, after all of that you are still keen to try, the recipe is here, and meanwhile I will aim to be more positive for bread week! So it is that time again when I, many might say foolishly, attempt to join in with Great British Bake Off and try my hand at the technical challenges from the series. Will I last beyond the first week? Will I ever find a love for baking bread? Will I manage to source the increasingly bizarre ingredients as the challenges progress? All will be revealed in the months ahead, but for now, wagon wheels. 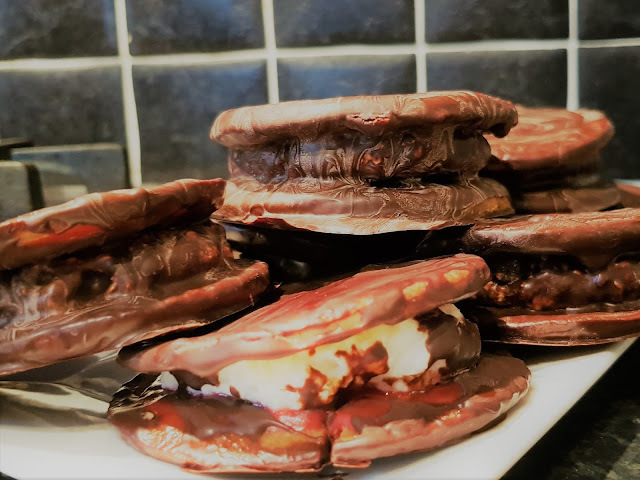 Saturday morning came around, after a week of long shifts, a poorly child, and a general air of chaos and disorder hanging over the house, I obviously decided the best way to spend T's naptime would be making biscuits, jam, marshmallow and attempting to construct wagon wheels. Not my best idea in retrospect, or the atmosphere most conducive to some relaxed baking, but it wasn't a complete disaster. It was a less than promising start. The Husband commented that he didn't really like wagon wheels, and I was inclined to agree with him. I also forgot lesson number of one Bake Off challenges, which is to be vaguely prepared, have a relatively tidy kitchen and to read the recipe. I didn't realise when I used the egg yolk that I would use the white later in the recipe so wasted it needlessly. I also had a distinct lack of clear work surfaces which made the whole process trickier. However, the recipe was actually quite manageable. The biscuits were simple and tasted really good, and I was reminded of the simple joy of making jam too. The marshmallow was the most tense aspect, involving whisking egg white while also boiling sugar and adding gelatine. Having used a stand mixer to help I found that the whisks didn't reach deeply enough into the bowl to actually whisk the single egg white so I ended up dashing between the mixer and the pan trying to keep an eye on both. Despite the multi-tasking required the marshmallow, somewhat to my surprise, actually came together well. With all the components made, next came the assembly, and this is where things went somewhat downhill. Firstly, a coughing fit meant that T needed a snuggle to settle him down back to sleep. Whilst the cuddle was a welcome break I returned back to the kitchen to find the marshmallow had morphed from a soft, glossy, swirl to a springy, solid mass. I then needed to enlist The Husband's help to locate my piping nozzles, which were apparently stored in the exact place that I swore adamantly I had looked at least three times already. My slightly, ahem, informal approach to cutting the biscuits now became problematic, as they were not consistently round, which made pairing them up to be sandwiched together somewhat akin to a game of Tetris to find the ones that were most closely matched. 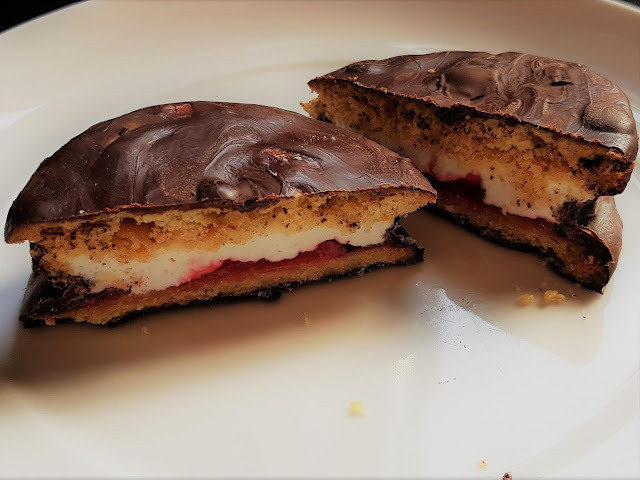 Then the firmness of the marshmallow made it tricky to pipe, and it was so well set that as I tried to sandwich the biscuits together a few biscuits snapped as the marshmallow put up rather an excessive amount of resistance. By this stage T was awake, well over two hours had passed, and my focus was on getting finished and trying to rescue the kitchen rather than delicately coating my biscuits. 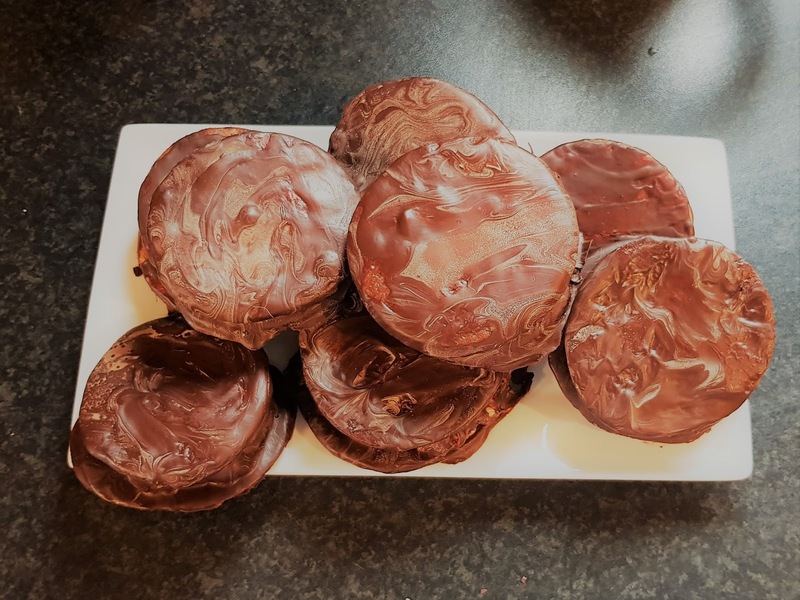 As you can tell from the pictures this part was particularly slapdash, and for some reason the chocolate marbled as it set. But, it did set, and they did look vaguely recognisable, so all in all I'm counting it as a success. So what was the verdict for technical challenge number one? Well, the recipe was surprisingly easy to follow, with great results for all of the components. They were really tasty, although the dark chocolate made them very rich, and The Husband was not a fan as a result. T, however, adored them, and they got rave reviews from everyone else who tried one. We have now, also, taken to calling them wheelie wagons, after we repeated the phrase from the programme, T has adopted it as his own, and it was far too lovable to even think of correcting him. I did keep thinking how easy it would be to go and buy a packet if I really wanted the option of eating a wagon wheel, but actually the end result seemed to reflect the effort that had gone into it, and it felt like a special treat. 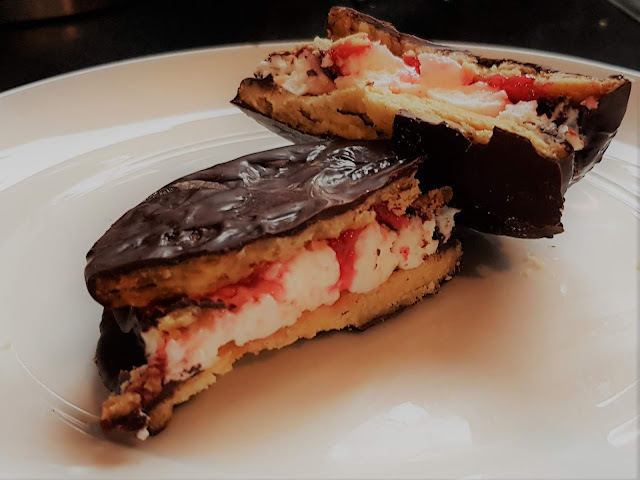 I won't be writing out the recipes this time around but if you ever have a hankering to rustle up a homemade wagon wheel, you won't go far wrong giving this recipe a try. The first week of Bake Off - did you watch it? I spent some of today valiantly attempting the Wagon Wheel technical challenge (post to follow), and reminded myself of the many reasons why it is better, in this instance, to watch than take part. They were not a complete disaster though, and I even managed to restore the kitchen to a relatively acceptable state, which I think The Husband felt was a particularly noteworthy first. The first night in recent days where I actually had to sing to T at bedtime. After a few days of illness, including the gut-wrenching call from nursery to say he was not himself and had a temperature, and a trip to the doctor yesterday when he suddenly went downhill, he happily seems to be improving today. The last few evenings he has been asleep almost immediately after his bath, and as he requested one song after another tonight and then lay chatting to himself in the dark, it was nice to feel like he was getting back to his usual self. The first quiet weekend in a while. We were actually due to be at a friend's daughter's birthday party tomorrow, but thought we should probably not turn up with a poorly, germ-ridden toddler. 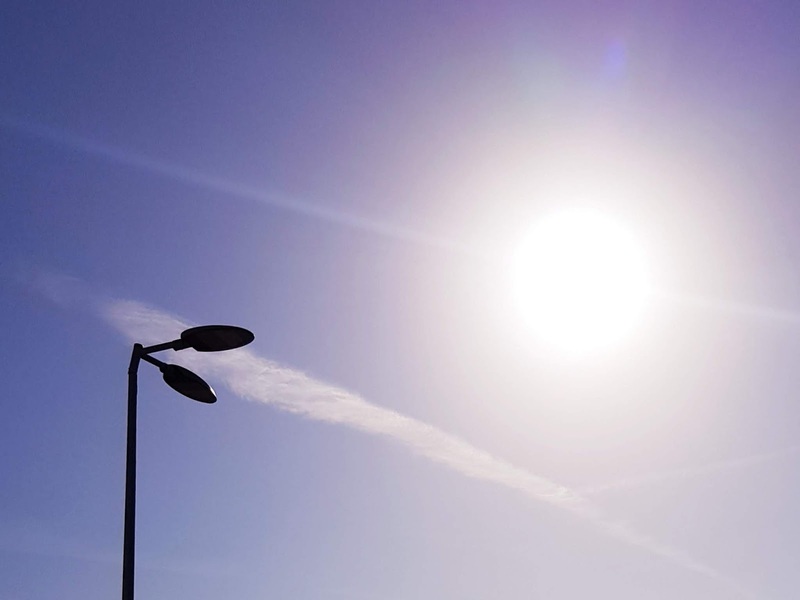 And so it is, after busy birthday celebrations, and then an intense stretch of shifts at work, including the Bank Holiday weekend, it is nice to have some slower-paced days ahead. September also brings with it the first days of my third trimester. Time appears to be flying by at an alarming rate, and so I find myself without that usual nostalgic new beginnings feeling (usually accompanied by new stationery) that I usually associate with this time of year. Instead I feel more on a slow countdown to December, enjoying life as we are, and anticipating instead the new beginnings that for now, are just around the corner. We had a visit from a plasterer this week too, the first forays in to moving T to a "big boy" bedroom. While the co-ordinating of the different jobs, and the clearing out of the room do not fill me with immediate joy, especially as the latter has developed into a clear out of two or three other rooms as well, I am very excited for him to have his first proper childhood room. I can't wait to get on with picking colours, and fabrics, finding homes for his favourite things and creating a space for the lovely little boy he has grown into. And so September is here, bringing with it the first days of Autumn, the promise of cooler days, cosy evenings, and my favourite part of the year. boy, not a baby. And what a little boy he is! He is such a character now, in the most delightful way, and loves to make others laugh. He can be a great mimic, and loves doing different voices. It is lovely to hear him, entirely lacking in any sense of being self-conscious, singing at the top of his voice, purely for his own amusement. The rainbow song and 1,2,3,4,5 are some highlights of his repertoire, but my favourite is still hearing him call Humpty Dumpty "Hoppy Doppy", one of those childhood variations we have now all adopted. However, despite his brilliant sense of humour, and his easy, beautifully affectionate nature with those he is close to, he also remains studiously inquisitive. We have taken him to a few children's theatre productions, and he watches intensely, taking in every detail, which he then animatedly recounts later. Given a new toy or in a new place he still likes to get to grips with how everything works, and with new books he listens intently and then likes to go back through pointing everything out. Books are a real shared love of us all, we go to the library each week, and I adore cuddling up with him reading stories, increasingly amazed by how many books he can recite off by heart. Favourites at the moment are the "What the Ladybird Heard" series, an "Alfie" book by Shirley Hughes which gave me all sorts of childhood nostalgia when he got it, and anything by Rachel Bright. Given the chance he would be engrossed in a screen, and while it is nice to see him enjoying favourite programmes like In The Night Garden and Hey Duggee, I find it fascinating and worrying in equal measure how completely absorbed he becomes when they come on! Whilst I don't doubt the screen will be a useful diversion at times, particularly when the second baby comes along, I try to make sure it isn't how we spend the majority of our time, and also try to talk about things when we watch them. For his birthday, though, he got some toys with his favourite characters on, like a Peppa Pig tea set, and trains and books from In The Night Garden, and it has been lovely to watch him play with those. Diggers, blocks and tools are also popular, and he got out his own hammer and screwdriver to help his daddy put together some of his birthday toys! 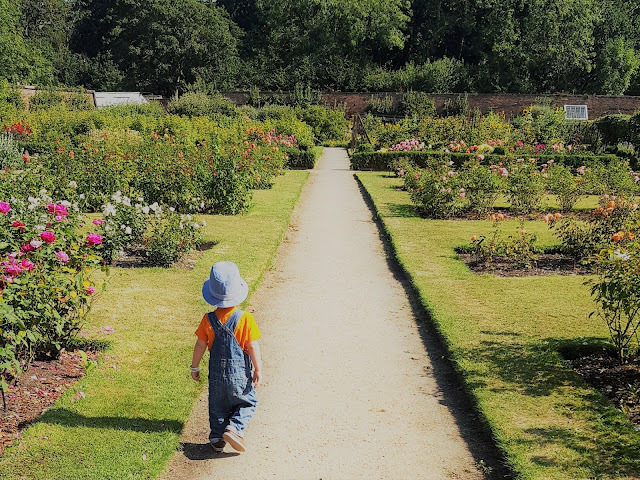 We also really noticed on holiday how much he loves exploring new places, be it a national trust garden, the seaside, or a playground, so we are trying to make it a more regular weekend activity to go out on "adventures" even if it just for a trip to a new park. Our days have lots of little routines, which I love sharing with him. From a bath and a book before bedtime, saying goodbye to Millie when we leave, to going shopping, for breakfast and then swimming on our Wednesdays off together, I take joy in the tiny traditions we are creating. He chatters away, and I adore how we have got to the point of having proper conversations, and how well he communicates. We have, in recent months, entered the realms of pretend play, and his birthday gifts included a playhouse and kitchen, resulting in endless tea parties in the last few days. I won't pretend he is perfect, he can be cheeky, and gets giddy when he is tired. He has also developed an incredible skill for selective hearing, especially when tidying up or stopping doing something is involved. Tantrums are not unheard of, but currently aren't too frequent, and he can more often than not be quite quickly distracted. 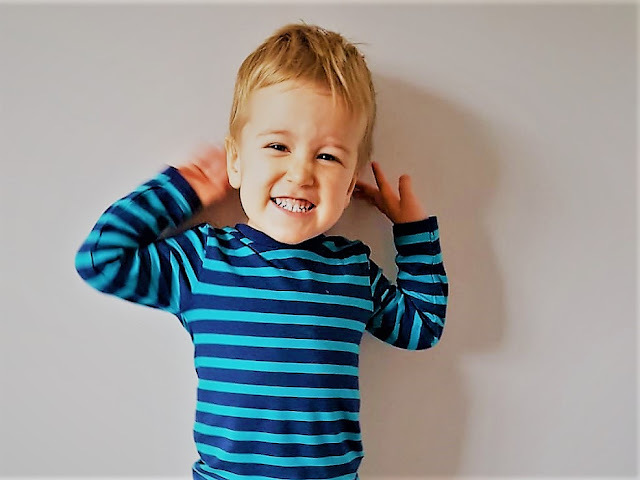 Bedtime and mealtimes can be a source of immense frustration, but not consistently so, and the vast majority of the time he makes parenting feel very easy. We haven't had too much experience of the irrational, illogical part of toddler personality yet (except one notable occasion when he cried because he wanted a yoghurt, while eating his yoghurt), though I am sure there is plenty to come. 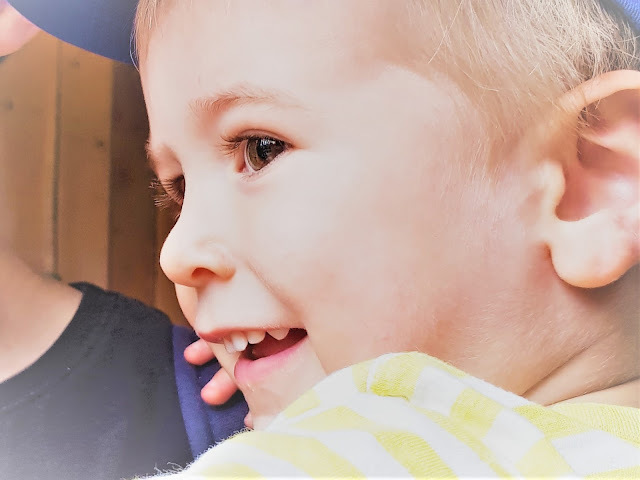 He continues to be incredibly adaptable, having moved up to a new room at nursery this month with seemingly minimal fuss. It was incredible to watch through the door as he quickly joined straight in with new people in a new environment, and to hear how well he has settled in. On most days he eats really well, loves all sorts of fruit and quite a variety of vegetables, though at nursery he can be a bit hit and miss. He loves a "cappuccino" made of frothy milk, and is gradually trying more meat, though his favourite is definitely sausage. He absolutely has a sweet tooth, though for him the best part of his birthday cake has been blowing out the candles! He likes to help in the kitchen and will stir, pour, and join in as much as possible given the chance. He also loves to play in the sink, and can amuse himself for ages given a basin of water and lots of containers to splash about with. My favourite picture from his birthday is the one above, because to me it represents so well what he has brought to our lives. 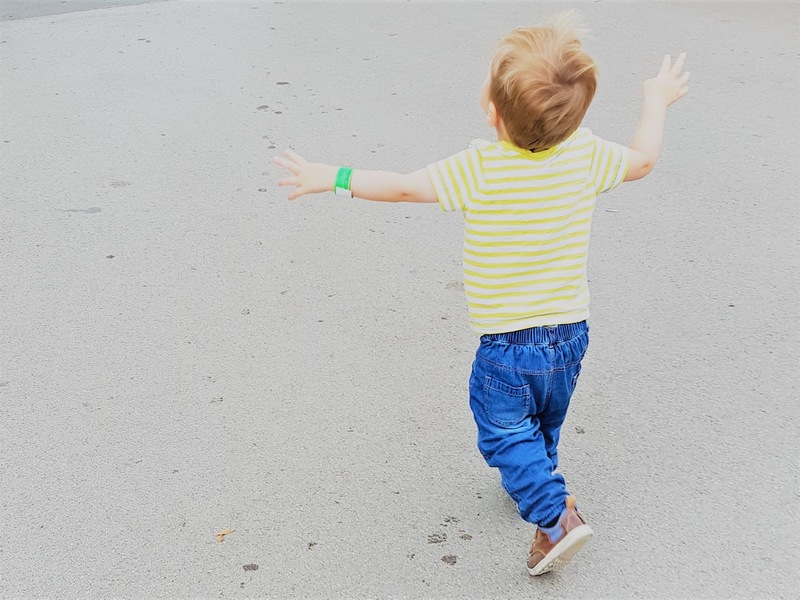 He went around the whole of the zoo like this, arms flung wide as he dashed from one place to the next, the epitome of joy and excitement. It is such a daily revelation to see life through the eyes of a child, especially one who is so happy, and so open to the amazement of the world around him. He reminds me so frequently to giggle at the silliest things, to find awe and wonder in the simplest moments, to always be overjoyed to see those that you love and to not take anything too seriously, or for granted. I can't believe he has been part of our worlds for two years already, and I am so incredibly grateful for every single day we have had, and all that is to come. The Husband got an email advertising free tickets to a local CBBC event this weekend, so we spent a lovely few hours there today. We had fun enjoying the sunshine, and the general festival atmosphere, and T was excited to recognise one or two characters from television. He loved running through the walled garden and seeing the animals in the farm too. It was great to have time as a family experiencing new things, something which we realised on holiday we wanted to try and do more of at weekends. We may have enjoyed some family nap time when we got home though! The incredible sound of our baby's heartbeat. We went this week for the 20 week scan, and all seemed well other than a baby rather like its mum who clearly felt that 8.30 in the morning was not a polite time to be bothered and so refused to cooperate with all of the efforts (mostly mine - examination couch yoga anyone?) to coax it into a more favourable position. Everything looked fine but we have to pop back in the next few weeks to try and finish off, and hopefully a late afternoon appointment will mean it is more amenable to a bit of activity. From there we popped to the antenatal unit at the hospital for some paperwork and caused a bit of panic when they realised I had been discharged from consultant care and that my community midwife appointment hadn't happened yet. It is all fine and sorted but the midwife there did a review and we got to hear the heart beating away which was a great end to the morning's appointments. Nothing that I can particularly remember, although the farmyard animals in the warm sunshine had a particularly pungent aroma today, as I'm sure you might imagine. Some hearty home cooking has been on the menu this weekend, toad in the hole last night and shepherd's pie this evening, after a few hours in the kitchen yesterday during nap time. It had been cooler earlier in the week when I did the shopping, and I can't claim that the idea of either meal particularly appealed in the hot weather but they turned out well and it was good to spend some time pottering in the kitchen with the radio on. A little overwhelmed that the weekend is over already. It has been a good balance, with a productive day yesterday and then a trip out doing something a little different today. It does seem to have gone really quickly though, and being out and about both days has meant that home feels a little unloved and I don't feel quite as prepared for the week ahead as I might like. However, there is always tomorrow for getting sorted, and right now I definitely feel ready for bed! The first time I've been here in quite a while. In some ways it is lovely to find this place unchanged, in other ways I'm desperate to give it an overhaul; but not tonight, not for now, just writing something feels maverick enough. The first time actually pressing the publish button in many, many months, but not through neglect. Well, maybe a little bit of neglect, but I haven't forgotten this space. I have missed being here very much, I even have a few half written paragraphs all about trying and failing to post something, anything. Life has been busy, no more than anyone else's, but I have found myself just about making it through the days for such a long time that days became weeks became months, and the longer I was gone the harder it was to pop back. And now I am here and hopefully it will be easier to come back again soon. The first post in a while on Instagram too, as I have joined in with the first day of the August Break prompts over on Instagram. A version of my first effort is above, but even trying to copy that picture onto here in a format that looked of vaguely decent quality felt a little beyond me tonight, operating on multiple devices as I am. 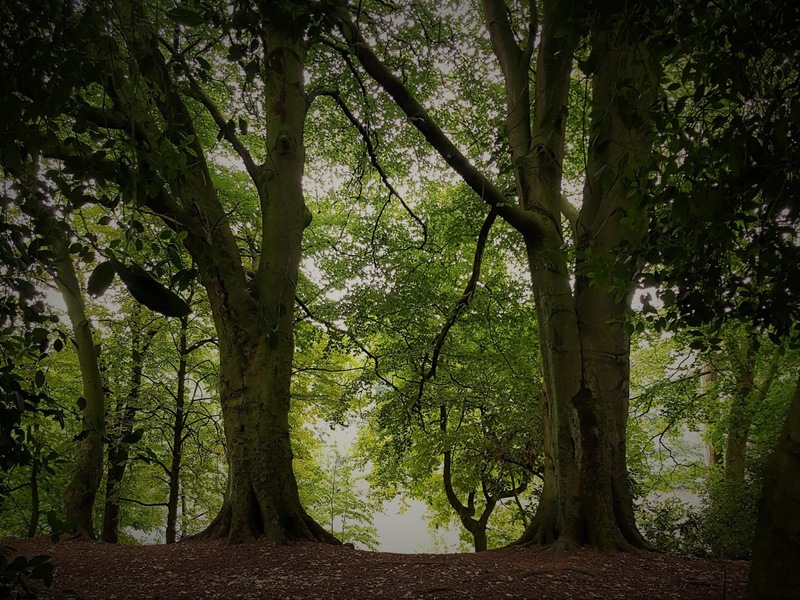 I won't aim to post my attempts here each day but I do hope to join in on instagram this month, so you are welcome to go and view future efforts there if you like! The first day today where I felt fully recovered from my decidedly middle aged injury last week in which I pulled a muscle in my back while looking at packets of herb seeds in a garden centre (having gone there for Sunday lunch and a spot of plant shopping). I have clearly not become any more rock and roll in my absence. Unfortunately I have immediately today managed to twinge my wrist picking up T and so I remain afflicted with minor aches and pains in a manner that is not quite fitting for a thirty two year old, let alone one who still thinks she is about nineteen. The first week where I have been properly back at work after a lovely long break. We have been lucky to have numerous holidays since I last wrote, visiting Berlin, Madeira and just recently two weeks around South Wales and Hereford. I shall not delude myself that I am going to share some lovely posts about our adventures, much as I would like to it doesn't feel particularly realistic based on my current form, but we have had some wonderful family trips and it has been great to start exploring places further afield as a family. The first month in which I will officially be the parent of a two year old. I'm not sure how that happened, and I will hopefully do a post around his birthday, but he remains equal parts cheekiness and loveliness despite growing up far too fast. The first year in which I might officially be the parent of a two year old and a newborn. If all goes well we have a new arrival due in late December. If T sets an example for his new sibling, it could mean that we are actually into 2019 before it makes its appearance, but hopefully we have incredibly exciting times ahead. And just like that the first post is done. I will try not to leave it so long next time, it is good to be back. all pictures and content © whatkatiewrotenext 2014. Simple theme. Powered by Blogger.